Most of her music pieces have been composed based on the rites of Korean Shamanism, and many of them were written for Wave Field Synthesis System (192 loudspeakers) playback, exploring the relationship between musical and physical spaces. At the same time she has been composing live electronic pieces for both traditional and non-traditional instruments, ranging from a solo instrument to a large orchestra, exploring mostly the primitive, empowering rhythmical elements and the noisy sound sources that the Korean ritual music involves. She is also active as a solo performer mainly seeking for the ways to combine three different sound areas on stage; acoustic instruments, analog and digital sound with handmade analog synthesizers with live processing on laptop. For more information as a performer, visit here. She is also working with other composers as a sound designer and music technician, creating electronic patches and sounds for their compositions. Currently she is working as a freelence composer, and is also one of the staff members in Institute of Sonology, giving a course on 'Spatial music composition for WFS system.' She is also one of the board members of Game of Life Foundation(WFS System) and Conlon Foundation(midified musical instruments). More information about her music and works can be found in other pages. Jing is one of the most representative metallic instruments from Korea, typically used in a supporting role, mostly in ritual and folk music. In this piece, the Jing becomes the main actor, revealing its own character through the performer who activates, de-activates, and controls the instrument and its behavior. The live electronics expands the possible space for the Jing sounds to be explored, and together they create a continual flow that is both ritualistic and human. The main idea of Dong-Nae Gut derives from the traditional Korean ritual “Ma-Eul Gut”, one of the oldest existing musical forms and one of a number of Korean traditional rituals, each with its own character, purposes, and processes. All are local events in which citizens pray for well-being, for a better, peaceful environment and for prosperity. Ma-Eul (“town”) Gut (“ritual”) is a very common example, and is still regularly performed. “Dong-Nae” is a more personal synonym for Ma-Eul. When Ma-Eul Gut is performed, the musicians – the local shamans – travel throughout a city, from its borders to every street. Throughout the journey music is played, people join in and sing along together. Kang’s choice of this ritual as material for her new commission was determined by the fact that we are bringing a travelling spatial music system to the very town where spatial music first arose, for a specific event in a now globalised world, as a kind of ritual for Venice. Kang’s composition bridges new technology and an ancient musical form, thus transforming the ritual into an abstract phenomenon and becoming a new artform. The ritual acts as a source behind what is heard, rather than being directly perceived by the audience. If music’s destination is freedom, the idea of sound-sources becomes problematic. With WFS the loudspeakers are no longer sound-sources but “sound-intermediaries”, producing a discrepancy between seeing the loudspeaker, which is nearby, and hearing the sound-source, which might be miles away, or even in front of the speakers. To Kang, this freedom of sound-movement in WFS encourages the listener to adopt an openness to perception, so that she likes the idea of not providing a fixed notion of where a sound belongs, in distinction for example to hearing piano sounds and their reference to Western music traditions. The aim is to enable each listener to judge for themselves what they are actually hearing. The musical continuum formed by these three compositions reflects their composer’s intuition that there is no room for historical time in musical time. Music is concerned with an eternal present, as we see from Nono’s poetic title: the historical past (Monteverdi) is reflected in the musical present (Snoei’s approach to Nono) and leads to new worlds (Kang’s fusion of Eastern and Western traditions). That you have to travel to find yourself is a wisdom that was a cliché - because it so often proves to be true. Many Composers found their own voice abroad: in the early-twentieth-century Paris, for example, was the newly arrived Russian Stravinsky very compose and Manuel de Falla wrote primal Spanish music. Similarly Ji Youn Kang became aware of her Korean roots when she left her native country. After her musical education in Korea she studied first in Canada and then in The Hague, "because young composers around the world talk about the electronic music department there," she says. Percussion is an integral part of traditional Korean rituals, used in a more or less fixed pattern: always first used a slow rhythmic movement that gradually builds to an ecstatic climax. Kang-shin is there to modeled. Also, get a very Western interaction between soloist, orchestra and electronics. "You can display something unique by combining. Elements from various cultures and time periods In the world there is the sacred and the mundane together and it is the interaction that gives them SIGNIFICANCE. My music is not made ​​to be understood - it is purely a sound flow so you can be lead away. " -commissioned by Gaudeamus Muziekweek and Fonds Podium Kunsten. One of the most interesting aspect of the Disklavier is its communicative instrument: it not only receives MIDI signal from a medium, in this case from a computer, but also can sends its information. This inspired me to think deeply about making the process self-perpetuating so the Disklavier can play itself. Such a situation differs fundamentally from being sent performance data by a pre-programmed computer. Especially in the area of live electronics, this enables the composer to build an entire musical form and structure using the computer. The feedback is searchable; both in relation to the data required to play the Disklavier and to the sounds produced, including the familiar piano and other (mechanical) sounds. Such an idea, I believe, can be the starting point for enhancing the characteristics of the Disklavier as a self-playable instrument. '-Nory' on the title 'Machi-Nory' came from the Korean word, meaning to play. One of the most distinctive characteristics of the traditional bamboo flute in East Asia is its disonance, frictional tone color, and airy noise. Even with its quite unstablity in tone, it takes a strong role in many Ensemble music as well as the symbolic meaning. This piece is created upon the goals to create an interesting ways to reveal its characters, starting from the consideration on how to explore and utilize its physical body and its sensitivity, and well integrate the means of electronics. Creating music for an unconventional instrument challenges the composer, performer, and instrument builder to discover the artistic quality from the characteristics of the building materials such as wooden and metallic plates, its shape, and motion. The primitivity and mechanics of the new instrument has provided a direction to a musical development, new techniques to perform, a space for the treatment of the sounds with electronics. More importantly it invites the human breath into it. The piece is written for SonolobDuo, who was collaborated with the composer(myself) and the instrument designer Wen Chin Fu. Ji Youn Kang is a professional composer, especially in Contemporary, experimental music. Throughout her education in Composition and Sonology, she gained required skills in both acoustic and electronic music compositions. Her works cover from music for a solo instrument such as Cello and Piano, to a large orchestra, with/without Electronics. Not only contemporary music, she has experienced in composing for many different purpose such as music for film, children, and other media. You can find examples in 'Work' page. Ji Youn Kang is proficient in creating software tools for other performers and composers. As a electronic music composer herself, she developed the skills how to design the tools for others to perform, to interact with other instruments and performers, and to design the software that sounds right for the customers. Ji Youn Kang is also a performer in Experimental music scene. For more information about her own performance, go to the page 'KANG'. Ji Youn Kang has sufficient skills to help in techniques for Music Composition, and Electronic music performance. She can perform for pieces of other composers, and can be in charge of sound engineering for a concert. She can help a composer who has an idea of Electronic music composition and doesn't know fully how to realize it. Any technical aids, realizing your project and idea, need hands, do not hesitate to contact her. Ji Youn Kang is an excellent adviser and coach for ones' musical project, research. Because of her own various experiences, she is able to give her insight into difficulty that one can have in composing, proceeding a project or doing a musical research. Do not hesitate to contact her to make an appointment to discuss your issues in your creative process. This is one of her specialty. Ji Youn Kang knows how to deliver her knowledge and is currently teaching at Institute of Sonology in The Royal Conservatoire in The Hague. Ji Youn Kang is widely open to collaborating with other artists, composers, and performers. Through her experiences, she has developed her communication/discussion skills on creative projects; finding solutions, providing new ideas, and supporting other's visions! - sound samples for your musical productions. Would you like to work with her, ask questions, or have more information? Please contact her. Inspired by LI Bai’s poem (see below), it aims to invite the audience to a sound journey, a euphoric state of mind as being happily drunk. While every reality becomes vague, one can just enjoy being at the moment. Rolling Stones (2018) is to perform live in a hidden location (under a table in this occasion) and the performance is projected to the audience in real time. With very simple object, it aims to focus on motion by force and its sound. a behavior when the engine starts. Those two imaginations invited not only mechanical sound gestures but also a generative/organic behavior. LIGHT LEAKS (excerpt) from lichun tseng on Vimeo. Sound track for the experimental Animation Film by Marjolijn Dijkman. The result and relative music pieces were presented as a series of electronic music pieces ‘Nea Rim Gut,’ which includes 2 pieces for live electronics and 3 pieces for the WaveFieldSynthesis system. The research was aimed to find differences in the definition of ‘order’ and ‘disorder’ between the Korean and Western culture, and attempt to apply into the process of music composition. Research Subject: Musical Space Travel: research on space in electronic music composition. The idea of ‘musical space travel’ is taken directly from Stockhausen’s comment on his piece ‘Oktophonie’, where the music is spatialized with 8 speakers. He was expressing that a new musical experience was achieved by the listeners being able to sit inside and being surrounded by the sound, and his musical layers could be recognized individually. The first is to write and perform electronic/electro-acoustic music based on the consideration of ‘space’ as a compositional parameter. It means that the spatialization of sounds in music is not added but is planned and regarded as one of the significant elements for composition together with other parameters such as sound construction and rhythm. In order to include the spatialization in the process of composition, it is necessary to find the relative meaning between sound and its spatialization, and this relationship will be found by investigating the spatiality of ‘sound’ in both Western and Eastern traditions. The second is to find the ways in which, and to what extent the ‘physical space’ can be regarded as an instrument to generate sounds and to create a musical journey for the listener. This objective is based on the consideration of a physical space as a tool for creating music according to its own potentiality to create different reactions to sound reverberating and resonating. 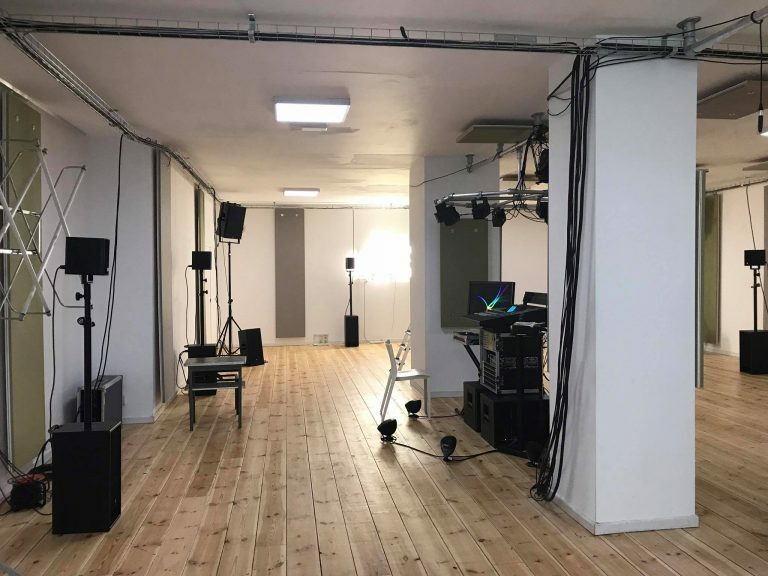 Different characteristics of a space can be discovered and utilized by experiments using real-time in/output with media including microphones, speakers, and relative sound generating systems for controlling in/output data. It aims to trigger the paths for the dynamic sound travel, and for the space to be used as an instrument that is manipulable and differently organizable. Following to the characteristics that Segmod offers, which are few and quite limited in function compared to commonly used applications for creating sounds, accordingly challenging, this piece is aimed to reduce the musical elements as much as possible, and to focus on rhythmic structures that pulses and their variations provide. ACToolbox is used to generate a pattern, and numbers are generated according to that. Pulse wave is the main oscillator, with its frequency between minimum 1hz to maximum 100 Hz varied by the configured pattern, and only in few cases there are other types of waveforms included, and used in the part that varies its timbre. Making the piece into stereo was essential as the rhythmic structure and its variation not only happen in musical space, but also between two different channels. 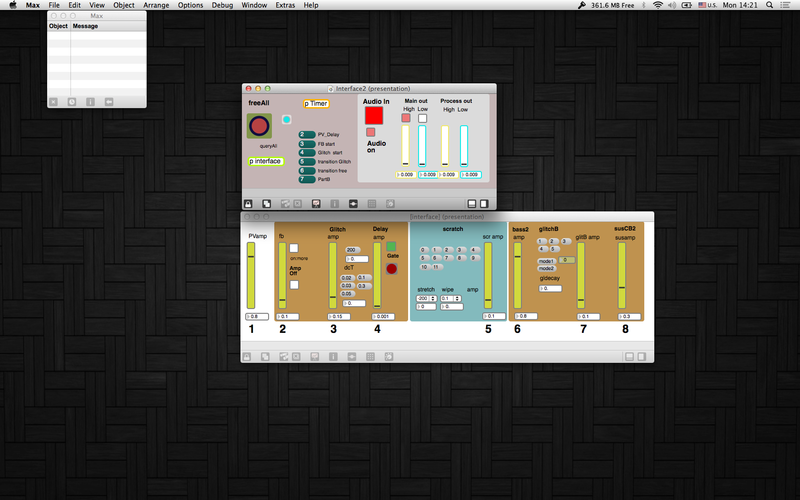 "Time-Folding" V 3.2 | Live Elec.Acou. "BiNaRi" | Ensemble, Live Elec.Acou. "Time-Folding V.5 | Live Elec.Acou. "Time-Folding V.6” | Live Elec.Acou. "Ohimè, dov’è il mio ben" | Spat. "Time-Folding V.2" | Live Elec.Acou. "Time-Folding V.3" | Live Elec.Acou. "Time-Folding V.4" | Live Elec.Acou. "Time-Folding V.1" | Live Elec.Acou. "Symfonie der Zuchten in het Rijksmuseum twenthe" | Spat. "Sound of Protest" | Live Elec.Acou. “Piano SiNaWi” | Live Elec.Acou. “Enfolding Plane II” | Elec. “Enfolding Plane I” | Elec. “Polytope de Cluny” | Spat. “Open your words” | Live Elec.Acou. “Yun-kkot Man-na-lu Ka-nun Baram gatchi” | Acou. The Second Performance of A collaborated piece ‘SEASCAPE’ for Viola and Electronics composed by Rens Tienstra (and electronics by Ji Youn Kang) will be performed again at a old church in Noordijk. 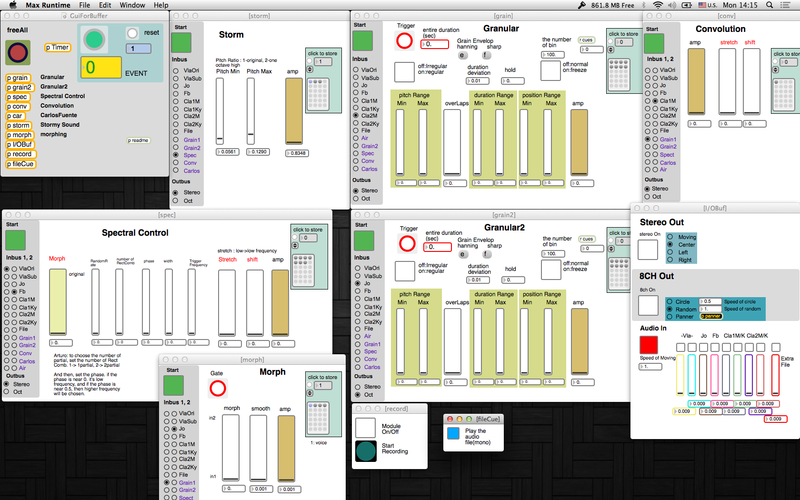 Radio Tonka - A free improvisation with a new chaotic sequencer programmed in SuperCollider, controlling with Benjolin and game key pad. Performing 5 composed pieces that have been composed with collaboration with Mei Yi Lee. Opening hour: Tuesday – Sunday: 11.00 – 18.00h. Dong-Nae Gut for the WFS system, commissioned/premired at Venice Biennalle, 2013 will be performed at Concertgebouw, Brugge! The Audiopolis series is curated by Francisco López. Solo Live Electronic series 'Time-Folding' on Noodlebar Rotterdam! Time : 17nd, May, 8:00PM. On the recording the whole image of spatialization and the sound quality cannot be heard as the original. Sounding Sculpture is a project by percussionist duo SonoLab (Mei-Yi Lee and Vitaly Medvedev). It brings together instrument builders and composers to create cutting edge percussion works. 'blow bow bowl' composed by Teodora Stepančić for 'Suikinkutsu', designed and built by Yukari Sawaki & Roberto Garretón, 'Gramophones' composed by Hugo Morales Murguía for 'Stereo Horns', designed and built by Neon & Landa. Sounding Sculpture from Neon & Landa on Vimeo. The piece uses crude materials and usual/unusual instruments to create a continual flow that is both ritualistic and human. These instruments are not only there to be played directly, but also to give an opportunity to the performers to control, react to, and deactivate them, developing a more bi-directional relationship with the instruments. Special care was taken to pick and create instruments that can interpret and amplify minute and tender bodily gestures as large and harsh musical ones. This performance borrows characteristics of the Korean ritual of Sit-Kim-Gut, which aims to clean the body and spirit of the living and to comfort the deceased. The harsh, heavy, noise material, together with a exciting rhythmic development leads the whole to the moment. "氣 CHI" Live 1. Sit-Kim-Gut and Rock’n Beat from Ji Youn Kang on Vimeo.